I've been eyeing this stew for about a month now, ever since I saw it posted on A Couple Cooks, and recently got around to making it. And, boy, am I glad I finally did! It's quite simple and brings together lots of vibrant flavors. A wonderful mixture of spices adds a bit of an exotic flare, while the yogurt, lemon, and cilantro keep it light and fresh. I love that each of the ingredients not only brings a unique flavor to this dish, but also that they each contribute their own big nutritional punch. There's lots of protein, antioxidants, and vitamins in that bowl up there. This is one of those dishes you can not only enjoy for its great flavors, but also for its powerful nutritional offerings. Notes: Obviously, fresh chickpeas are best, but canned will also be delicious. This stew can be served with brown rice or quinoa. A quick note on the quinoa: I prefer to sprout my quinoa whenever possible, to increase the nutritional and digestive benefits, but non-sprouted quinoa will also work just fine. The directions for this are the same as I have written below, just exclude the "day before" instructions. The stew itself is fairly flexible. I can imagine that a number of diced vegetables would make a great addition; feel free to throw in some of what you have on hand. (The day before...) In a glass bowl, mix together the quinoa, the first two cups of water, and 2 tablespoons of yogurt. Cover and place in a warm place for 12-24 hours. When you are ready to cook the quinoa, strain the quinoa in a fine sieve and rinse well, until the water runs clear. Add rinsed quinoa to a medium pot with the salt and the last two cups of water. Bring to a boil, then cover and simmer for 12-15 minutes. Fluff with fork and set aside. Heat the olive oil in a large pot. Add the onion and saute for 5 minutes. Add garlic and saute for 30 additional seconds. Stir in the paprika, cumin, coriander, turmeric, ginger, cinnamon, salt, and black pepper. Stir for 30 seconds. Add vegetable broth and diced tomatoes. Bring to a boil, then add sweet potatoes and chickpeas. Simmer the stew for 25 - 30 minutes, until the potatoes are tender. Stir in spinach and fresh lemon juice in the last 2 minutes. Serve stew with quinoa. Garnish with cilantro, lemon zest, and a dollop of Greek yogurt. Cookies, cookies, cookies. They're just about everywhere this time of year. Unfortunately all those cookies can mean refined sugar and refined flour over-load. These cookies are a nice break from all of that because they actually provide a hefty dose of nutrients. They're made with only wholesome ingredients and don't leave you feeling that yucky inevitable sugar crash associated with refined foods. So let's take a look... We've got whole grain flour and oats; fresh carrots; healthy fats from the coconut oil, flaked coconut, and pecans; good-for-you-tasty spices, and some natural sweetness from maple syrup. Yum. I just love healthy snacks. I've been making these cookies for a couple of years now and they've remained a family favorite to this day. We usually have the ingredients on hand and they're quick to throw together. No waiting for ingredients to come to room temperature or creaming involved - just two bowls, a whisk and a spoon. Notes: These cookies are easily adaptable. For example, you might experiment with different nuts, oils, flours, or even adding a little lemon zest. In the cookies pictured, I didn't add the optional raisins. Sometimes I throw them in, sometimes not. They're a great addition if you like baked goods with raisins. Enjoy! In a large bowl, whisk together the flour, baking powder, salt, cinnamon, and nutmeg. Add the oats, pecans, coconut, and carrot. Stir to combine. In a separate smaller bowl, whisk together the maple syrup, melted coconut oil, and ginger. Add the maple mixture to the dry ingredients and gently stir just until combined. 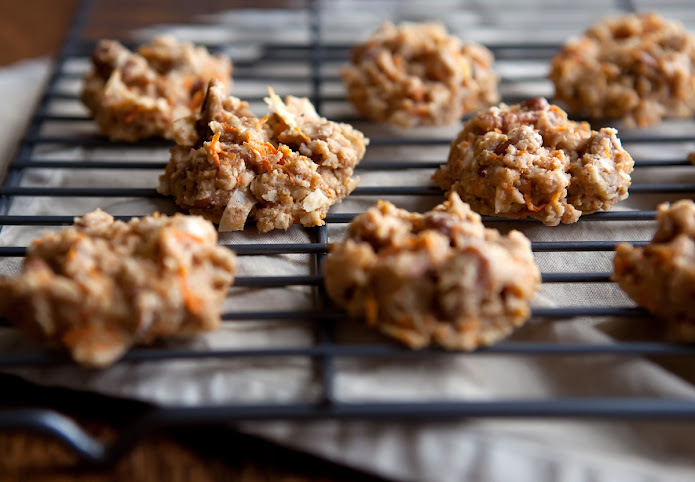 Drop cookies onto prepared baking sheets, one tablespoonful at a time. Bake for 10-12 minutes, until cookies are set and slightly golden. Now that our garden is literally overflowing with pumpkins, we're taking advantage of the bounty and trying to use as many as we can. Pumpkin is making its way into lots of things lately: bread, more bread, tarts (like this one), gnocchi, on dinner plates simply roasted with butter and salt, and now in these tasty little muffins. 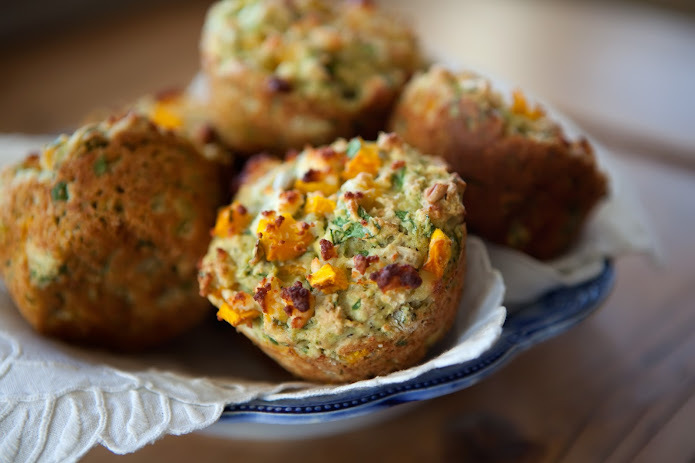 Notes: The first time I made these muffins I could tell the had a lot going for them... Unique, savory, wonderful flavor combinations, yada yada. BUT the only thing was that they were quite dry. Interestingly enough, the original recipe doesn't call for a speck of oil. Not one drop. I'm not sure why this is, but on my second batch I decided olive oil was definitely making its way into the mix. Cha-ching! That was all these little muffins needed. The olive oil adds the perfect amount of moisture and compliments the other earthy/savory flavors perfectly. I also increased the amount of pumpkin from 2 cups to 3, because pumpkin is delicious. Two more things: As noted in the recipe below, butternut squash may be used in place of the pumpkin. And, as usual, feel free to use exclusively all-purpose flour in place of the whole-wheat pastry, if you prefer. Place the cubed squash on a baking sheet. Drizzle with a little olive oil and add a few sprinkles of salt and pepper. Toss to evenly coat the squash and bake for 20-25 minutes, or until cooked through. Set aside to cool. In a large bowl, whisk together the flours, baking powder, salt, and pepper. Set aside. In a medium bowl, whisk together the eggs, milk, olive oil, and mustard. Stir in the sunflower seed kernels, Parmesan, and 3/4 of the feta. Add 3/4 of the roasted squash cubes, then gently fold in the spinach and parsley. Add the wet ingredients to the dry and gently fold just until the batter comes together; be careful not to over mix. Spoon the mixture into the prepared pan(s), filling each muffin hole 3/4 full. 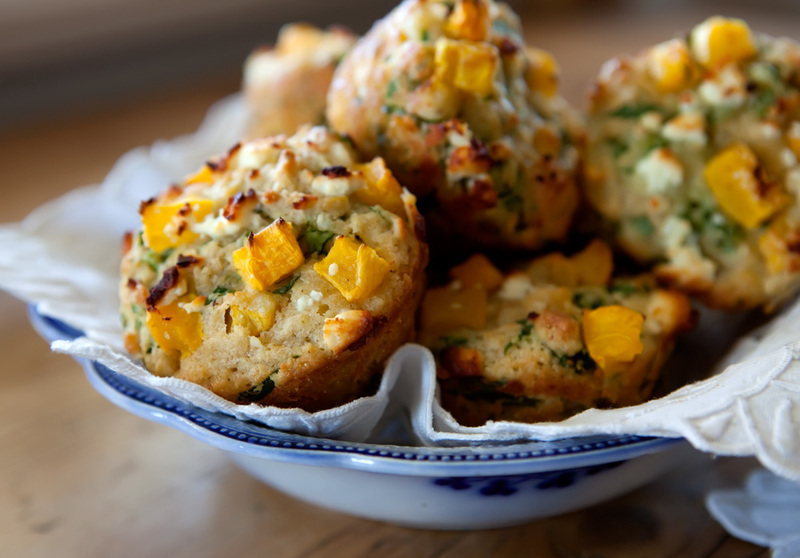 Top each muffin with a bit of the remaining squash and feta. Bake for 15-20 minutes or until the tops and sides of the muffins are golden, and the muffins have set up completely. Let the muffins cool for a few minutes in the pan, then turn them out onto a cooling rack. 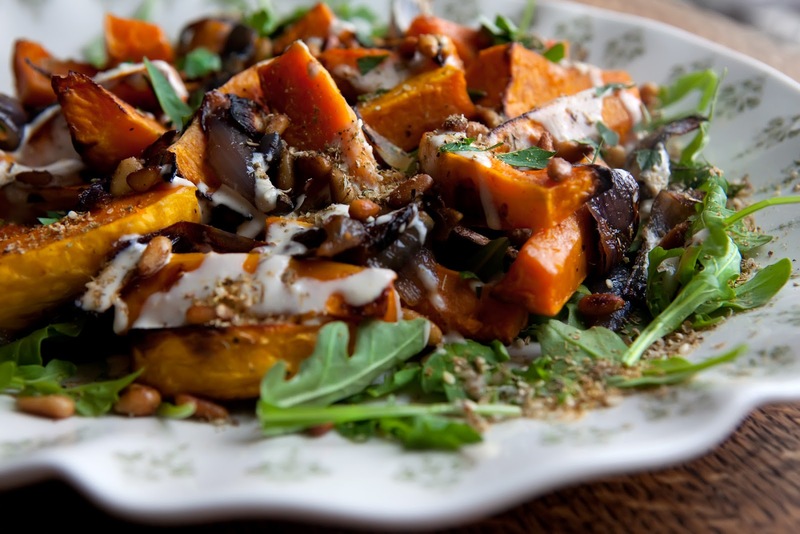 A little sweet and a little savory at the same time, butternut is easily my favorite winter squash. I love that it can prepared so simply and be so delicious on its own. This squash is a great main dish for two, or a wonderful side dish for about four. Enjoy it for lunch, dinner, or in between. It is a simple one to prepare and I think you'll love it as much as I do! 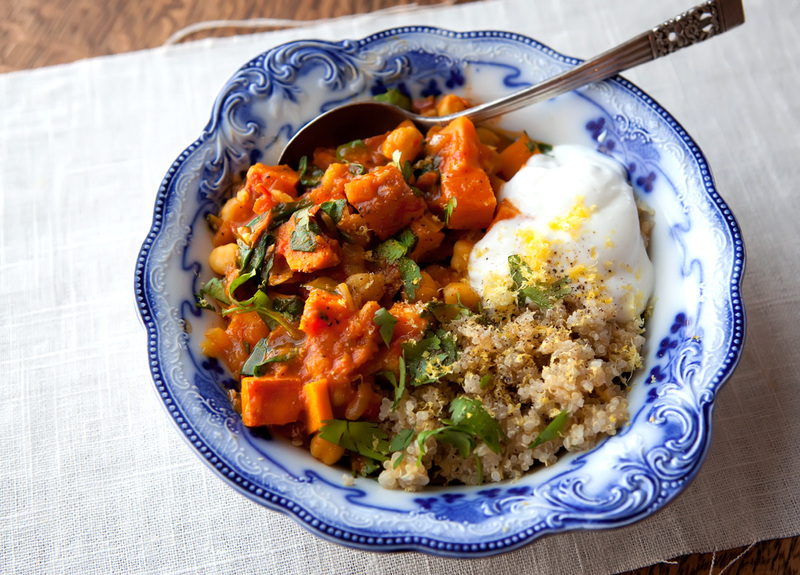 Notes: If you don't have butternut squash around, sweet potatoes will substitute well. Also, za'atar is a Middle Eastern spice blend that can be a little hard to come by, so if you can't find it I've included a substitute blend in the recipe below. Preheat oven to 475°F. Line two baking sheets with parchment. Put the squash in a medium bowl, add about 2 tablespoons of the olive oil, 3/4 teaspoon salt, and some black pepper. Toss well. Spread squash on one of the baking sheets. In the now-empty bowl, toss the onion with a tablespoon of the oil, a generous pinch of salt, and a little black pepper. Spread the onions on the other baking sheet. vegetables have taken on some color and are cooked through. Remove squash sheet from the oven, add the squash to the sheet with the onions, then set it all aside to cool. While the vegetables are roasting, place the tahini in a small bowl along with the lemon juice, water, garlic, and salt. Whisk until the sauce is the consistency of honey, adding more water or tahini if necessary. Set aside. Toast the pine nuts in a small frying pan over medium-low heat with a drizzle of olive oil and a 1/4 teaspoon salt. Stir often, until the nuts are golden brown. Remove from the heat and transfer the nuts to a small bowl to stop cooking. To serve, spread the vegetables out on a large serving platter over a bed of arugula (if using) and drizzle the tahini sauce over top. 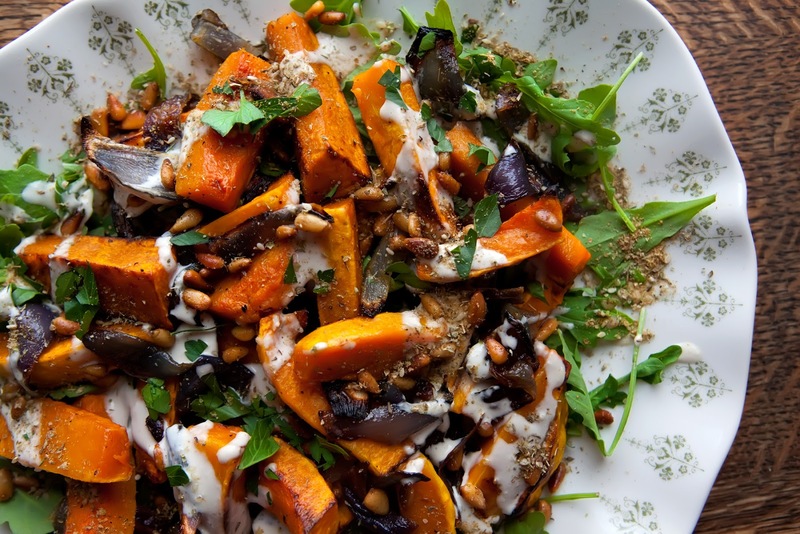 Sprinkle the pine nuts on top, followed by the za’atar (or substituted spice blend, if using) and parsley. 1. fivefold; consisting of five parts. Yes, I managed to put five different kinds of chocolate into one brownie. Why? Um.... Because chocolate is obviously the best food group ever invented. 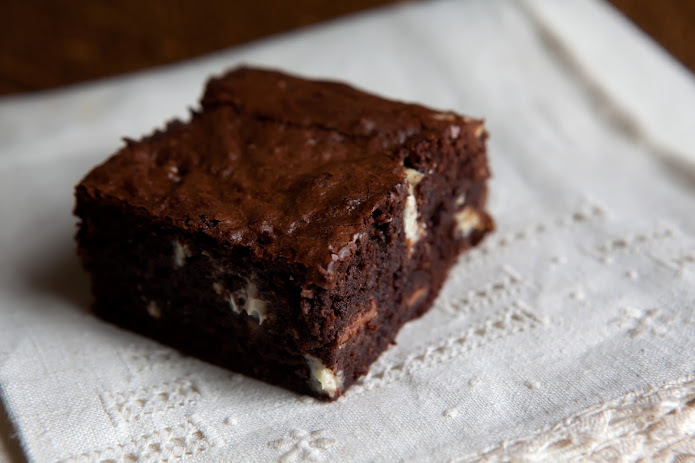 And also because brownies are obviously the best vehicle for consuming the aforementioned best food group. Obviously. Last spring my mom and I got to spend 10 days in England. We went in celebration of my graduation from college and it was one of the best trips ever. We had such a blast and loved every minute of our time there. It was wonderful to be back in the stunning country that we grew to love so dearly when we lived there years ago. It is our second home, you might say, and I daydream of it often. While out in the country one day, we stopped at a little tea shop and had lovely lunch. After our yummy sandwiches were gone and the meal had been paid for, I stopped to oodle at the glass case full of delectable baked goodies. And then... She brought them out. From the back kitchen with a plate full of warm, deep, dark, eat-me-now-and-you-will-never-love-another-brownie-quite-like-me-again brownies she came. I just couldn't not. So I asked for one ("...without an edge, please. "), paid for it in pounds, and walked out into the crisp England air. 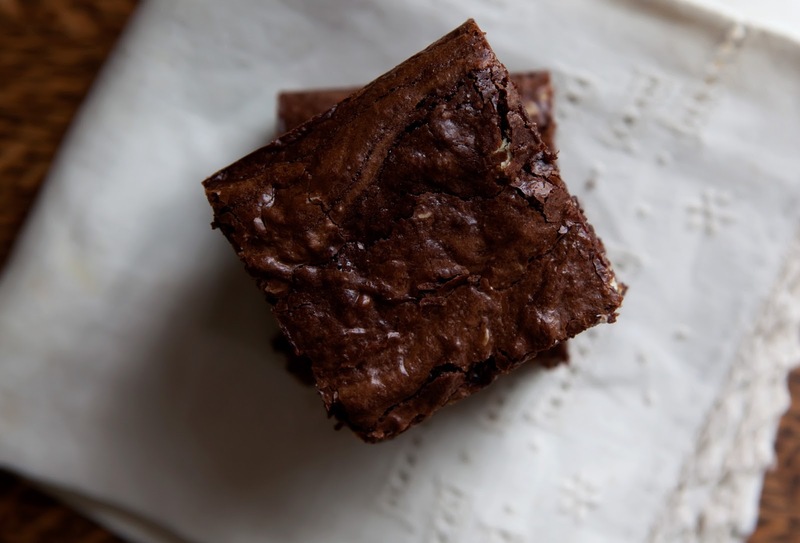 It has been since that very day, that very first nibble outside of Collington's Tea Shop on the cobblestone street of Brampton, England, that I declared that I would recreate that exact brownie. And now, over a year later, and... 20-ish (?!?) pans of brownies... Here they are. Oh my goodness. These are the most chocolatey brownies. (Remember the quintuple part?) They are so moist and rich. They are also perfectly thick, hefty, and not-too-gooey-but-still-gooey brownies you will ever meet. They are the brownies that remind you why the chocolate food group was ever invented in the first place. A simple word of advice: I think the brownies are at their peak approximately 1.5 hours after being removed from the oven (but who am I kidding, they're insanely wonderful any time...) because then they've set up nicely, are still warm and oh-so-rich, and the milk and white chocolate chunks inside stay soft and melty. Mmmm... Chocolate seriously doesn't get any better than this. Go make yourself a batch of Quintuple Chocolate Brownies and you will never love another brownie quite like these again. Notes: First thing: Use really high-quality chocolate (I prefer Callebeaut or Scharffen Berger). It definitely makes a difference. 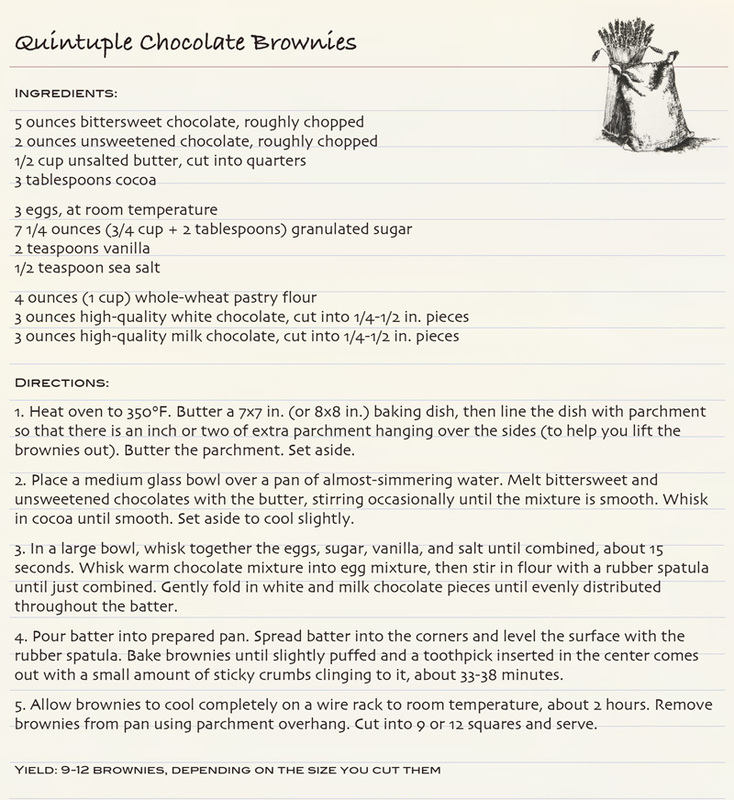 Second: Of course I had to create these brownies with whole-wheat flour, and yes, it works absolutely wonderfully here. I made a slight adjustment to the original quantity of flour because I added the whole-wheat, so if you are using all-purpose, increase the flour to 5 ounces. Third: I also found that, because of my addition of white and milk chocolate chunks, these are best with slightly less sugar in the batter than the original recipe called for, so the recipe below reflects this adjustment as well (the original calls for 8 3/4 oz (1 1/4 cups) sugar). And one more thing: I bake these in a 7x7 baking pan so that they're even more thick, but an 8x8 also produces a hefty brownie just fine. Other than that... Enjoy your chocolate-loving hearts out! Heat oven to 350°F. Butter a 7x7 in. (or 8x8 in.) baking dish, then line the dish with parchment so that there is an inch or two of extra parchment hanging over the sides (to help you lift the brownies out). Butter the parchment. Set aside. unsweetened chocolates with the butter, stirring occasionally until the mixture is smooth. Whisk in cocoa until smooth. Set aside to cool slightly. In a large bowl, whisk together the eggs, sugar, vanilla, and salt until combined, about 15 seconds. Whisk warm chocolate mixture into egg mixture, then stir in flour with a rubber spatula until just combined. Gently fold in white and milk chocolate pieces until evenly distributed throughout the batter. Pour batter into prepared pan. Spread batter into the corners and level the surface with the rubber spatula. Bake brownies until slightly puffed and a toothpick inserted in the center comes out with a small amount of sticky crumbs clinging to it, about 33-38 minutes. Allow brownies to cool completely on a wire rack to room temperature, about 2 hours. Remove brownies from pan using parchment overhang. Cut into 9 or 12 squares and serve.